Caveat: I'm in the Northeastern section of the United States so these tips will not apply to everyone. Step One: Join the Toys'n'Bricks forum. These people are serious bargain hunters and they talk about sales and availability of Lego sets constantly. Don't be a leech! Contribute where you can and let people know your location when you post about finding a deal. Step Two: Figure out which stores in your area carry discounted Lego sets. Target and Walmart are two stores in my area that put Lego on clearance on a regular basis. Marshalls and T.J. Maxx are two more in my area that both carry a limited amount of older/discontinued of Lego. Step Three: Keep your eyes open. You have to visit stores on a fairly regular basis. Get to know their stock. Understand when things get rotated into clearance. Step Four: Know when the big clearance "seasons" are. Just after Christmas is always good for getting deals, especially at the Lego store. Target has a summer clearance session. Step Five: Watch out for stores that are moving locations or remodeling. Companies don't like to transport a lot of stock between locations when they move, they also like having room for remodeling so this leads to stock being discounted or clearanced to accomplish these goals. Step Six: Be careful. A lot of stores initially put items on "clearance" at regular prices. Be willing to wait until the prices drop. Also, be willing to wait for prices to drop below the $0.10/piece "golden ratio". Step Seven: I've found -- through personal experience -- that if something is a good deal, I want it, and I don't buy it, it will not be there when I go back later. Don't be afraid to pull the trigger on a purchase. The Strongarms frame has been around, for me, for a while. 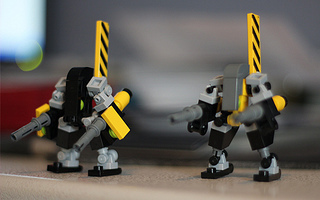 It wasn't until PAX East that I seriously thought about expanding the small set of these mechs that I had built into a functional team. This is the team as it appeared at PAX East. There have been some minor changes since. I'll take a few more photos at some point and post them along with the updated stats. I'm still working on making Stations that are specific for this team. For some reason I had an observatory in mind for them. I started laying out the basics of MFZ in another post, here. One thing we didn't touch on was the number of attachments you are allowed on a mech. You can have two of any one attachment. This leads us into special cases and the d8s. If you have two weapons at one range, instead of rolling 4d6, you roll 2d6 + 1d8. See below for how this looks at different ranges. is Overloaded Hand-to-Hand and is written 2Rh+d8. is Overloaded Direct Fire and is written 2Rd+d8. is Overloaded Artillery and is written 2Ra+d8. is a Single Shot Rocket (SSR) and you may have three of these for your entire unit. They are a 1d8 attack at Direct Fire range. Now, if you don't have or you get one of these , a free Green d8. You can have by itself, which is written 1Gd8. Or which is written 1G+d8 or which is written 2G+d8. 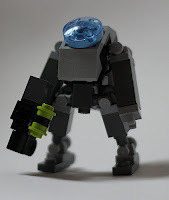 Beyond this we start getting into rule book territory, so unless people have a lot of questions this will bring the MFZ Primer series to a close. 1.) Joshua and I have very different playing and teaching styles. Not that that's a bad thing, it's just interesting to see. 2.) Split range weapons, especially a Direct/HtH split, are not good when teaching people how to play MFZ. 3.) I just may not be skilled enough to make Split Range weapons work for my teams. 4.) Bring more snack-type food. 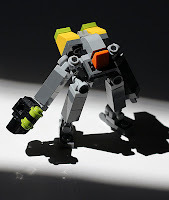 Running MFZ for 5(?) hours burns a lot of calories. Talking to a friend last week made me realize that I write mostly for people who are familiar with the game. He said a lot of the shorthand in the mech write-ups went right over his head. We'll look at the dice and the attachments they represent first. Red Dice come in three types. They represent the offensive capabilities of your mech. Hand-to-Hand. These are written as 2Rh. These have a range of 0 to 1 unit on the Ruler. Direct Fire. These are written as 2Rd. These have a range of 1 to 8 units on the Ruler. Artillery. These are written as 2Ra. These have a range of 8+ units on the Ruler. Blue Dice represent the defensive capabilities of your mech. These are written as #B. # = 1 or 2. 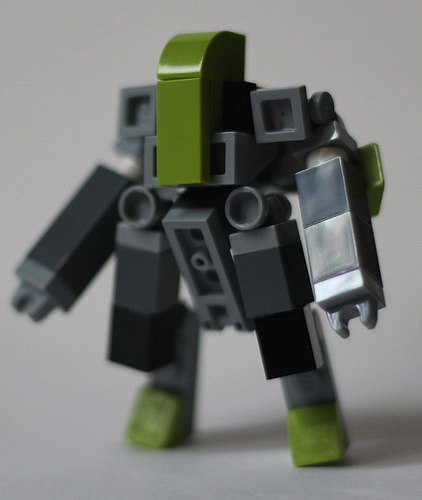 Green Dice represent the movement capabilities of your mech. These are written as #G. # = 1 or 2. Yellow Dice represent the communication/targeting (Spotting) capabilities of your mech. These are written as #Y. # = 1 or 2. All mechs have two White Dice. These are written as 2W. White dice can be substituted for any dice you normally roll during the course of the game. They can also be used for defense if you do not have a Defensive attachment, movement if you do not have a Movement attachment, or spotting -- at a limited range -- if you do not have a Spotting attachment. All these dice are d6s. There are also d8s, but I might wait for a second post before covering those. According to this update by Joshua on the Kickstarter page, he wants to get MFZ to us in a week or two. Awesome! "UPDATE Um. Wow. Because I put up a link to mfzgarage, he found out about me and posted a link to this page. I am, well, a 12 year old who has no kickstarter account, no email, no accounts on any forums, and has pretty much no money anyway. If you read this, Mantisking, then thanks a ton. You just increased the visitors of this site from perhaps 4 to anybody who reads your blog and clicks on the link. Thanks." No problem, Thaddeus. We're a small community and we have to stick together. If we post links to each others' sites, blogs, forums, etc. we can drive activity and attendance to all sites upwards. This activity should lead to more communication which should lead to a stronger community. A stronger community leads to a greater flow of ideas and a stronger game overall. Visit. Talk. Share. We all win in the end. Dr. Watsman is a builder that has quietly been putting together an impressive portfolio. He started out with modifying Soren's Conscript frame. Then he moved on to a creation of his own. Then he did a few more Conscript mods. And then he did something else! Please, check out his Flickr stream. He has more neat stuff. 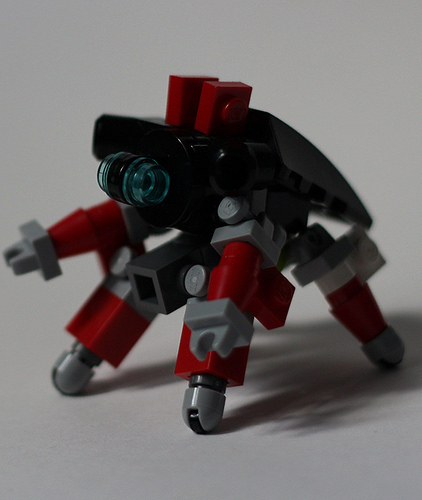 One of the designs I really like is my Spider Mech faction. 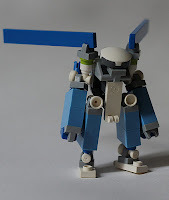 They're built using techniques that Joshua used to make his Fuchikoma Swarmers. I've expanded on those techniques to make a few different designs. The "team" consists of the four Basic Spider mechs (bottom center), the two Leader mechs (center), the two Heavy Assault mechs (outside left & right), an Artillery mech (back left), and a Daddy Longlegs (back right). I know that's a total of ten mechs, so at game time you have to choose exactly what you're going to play. At the PAX East demo I left one Basic and the Artillery mech in the box and fielded the rest. Let's look at them individually. I've got and idea on how to change these to a 2Y loadout. Keep an eye open! I just modified these. I took out an unnecessary 2x2 plate. These have been through the most iterations. I'm finally happy with this one. You may notice that 80% of the designs have an antenna, yet only the Leader mech actually uses it in its stats. It's there more for looks and a unified design style than anything else. 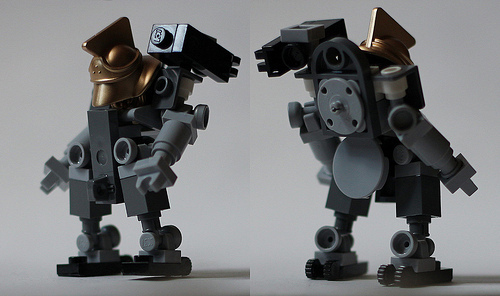 There's room to add 1Y on the basic mech but not on the others. You could possibly swap out the "1B for small size" for a "1Y for linked comm suite". Hmmnn. This might be worth experimenting with. I also designed some stations to be used with this team. I haven't actually had the chance to use them in a game though. I have had a chance to put the team on the table for a game. I'll leave you with an action shot.